David Einhorn's firm's current investor letter warns that Tesla is "on the brink" of failure. In his bearishness, David Einhorn has some company among prominent Seeking Alpha contributors. In the event the bears are right, I present two ways shareholders who remain bullish can stay long while limiting their risk. 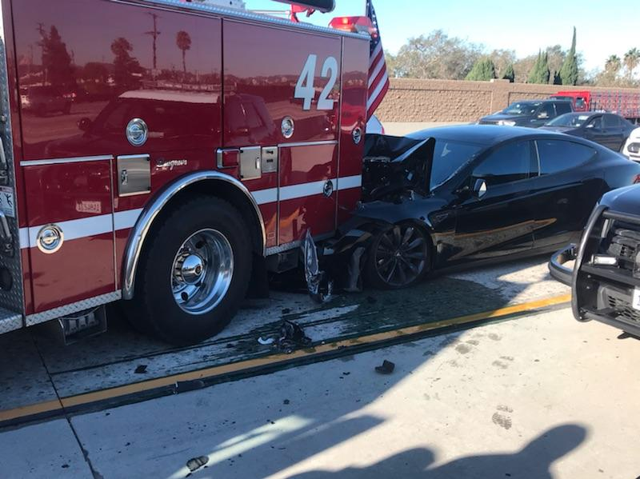 A Tesla Model S after colliding with a fire truck (credit: Culver City Firefighters). Greenlight Capital Warns Tesla "On The Brink"
According to Reuters, David Einhorn's Greenlight Capital said in its current investor letter that Tesla (TSLA) was "on the brink" of failure. In his bearishness, David Einhorn has some company on Seeking Alpha, including that of Bill Maurer who wrote recently that it can get worse for Tesla, as Maurer anticipates further headwinds, including pricing pressure on the Model 3. 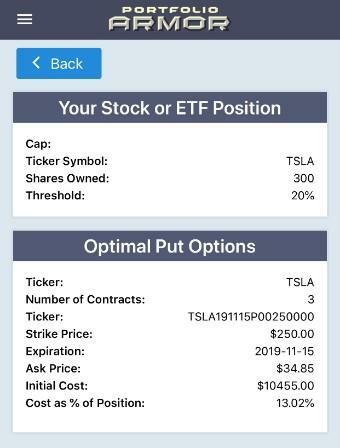 Tesla currently passes both of Portfolio Armor's two screens to avoid the riskiest investments, but my site's potential return estimate for the stock over the next six months is only about 3.4%, as you can see in the screen capture below. Screen capture via Portfolio Armor's admin panel. If you're long Tesla, chances are you're a lot more bullish than Portfolio Armor is, and certainly more bullish than Bill Maurer or David Einhorn. In case your bullishness on it ends up being wrong, I'll present two ways you can limit your risk. As a reminder: You hedge when you are bullish, and want to limit your risk in the event you are wrong. If you are bearish on Tesla now, you shouldn't own it. Let's assume, for these examples, that you have 300 shares of Tesla and can tolerate a 20% drawdown, but not one larger than that. Here are two ways to protect against that (the screen captures here are from the Portfolio iPhone app). 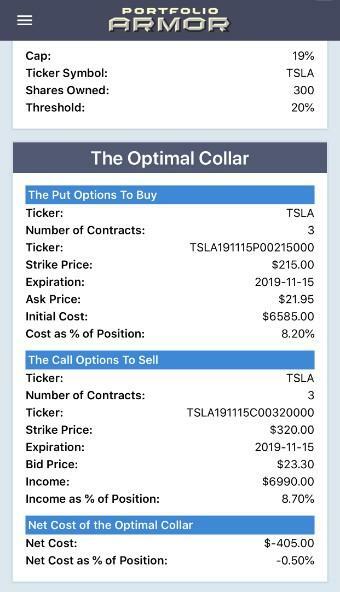 As of Friday's close, these were the optimal, or least expensive, puts to hedge 300 shares of Tesla against a >20% drop by mid-November. The cost of this protection wasn't cheap: $10,455 or 13.02% of position value, calculated conservatively, using the ask price of the puts (in practice, you can often buy options at some point between the bid and ask). If you were willing to cap your upside at 19% over the same time frame, you could have used the optimal collar below to get the same level of downside protection. The first thing you might have noticed with this hedge is that cost of the put leg is lower than the optimal puts in the previous hedge. That's because, after an iterative process taking into account the net cost of the collar, the hedging algorithm was able to use a less expensive strike for the put leg, which had a cost of $6,585, or 8.2% of position value, calculated conservatively, at the ask. But the income generated from selling the call leg was a bit higher than that: $6,999, or 8.7% of position value, calculated conservatively, at the bid price of the calls. So your net cost was negative, meaning you would have collected a $405 net credit when opening this hedge, assuming you placed both trades at the worst ends of their respective spreads. Wrapping Up: Why Hedge Now? A question I get asked sometimes is why hedge now? My standard answer is because you want to stay long while limiting your risk. But sometimes the implication of the question is that I should have written about hedging the stock at a higher price. Often, I have. In the case of Tesla, for example, I presented ways to hedge it when it was trading at close to $350 per share last August. Readers who want to stay long Tesla and are unhedged should consider hedging. To see this week's top names and hedged portfolios, you can sign up for a free two-week trial here.